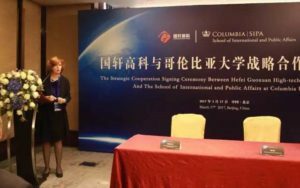 On March 17, 2017, Li Zhen, Chairman of Guoxuan High-tech, and Merit Janow, Dean of School of International and Public Affairs (SIPA) at Columbia University, signed a strategic cooperation agreement for the two parties. This strategic cooperation will achieve mutual benefits to both parties through their complementary advantages. 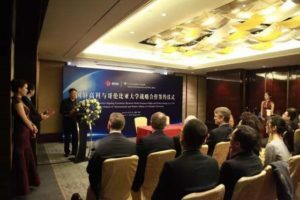 The two will set up joint laboratory for technology cooperation, promote programs on pioneering power battery research projects, and open “green lanes” for introducing talents with global visions. They will work together to conquer battery safety problems, improve battery capabilities and battery product designs to help advance the development of global clean energy vehicles and the energy storage industry. Joseph Stiglitz, Nobel laureate and former chair of US Council of Economic Advisers, David Sandalow, former Undersecretary at US Department of Energy, Liu Yanlong, Secretary-general of China Industrial Association of Power Sources, Professor Wu Feng from Beijing Institute of Technology, and experts from Tsinghua University and Peking University joined the event. In her opening speech, Dean Merit Janow expressed her appreciation to Guoxuan High-tech’s support to Columbia University over the years. She hopes the two could continue to strengthen and deepen their cooperation, and bring their partnership to the next level. At the signature ceremony, Guoxuan High-tech CEO Hu Jianglin also expressed that Guoxuan achieved an 80% revenue increase in 2016. The energy density of battery cells and systems also increased notably. The company is now building its global platforms in the US, Germany, Japan, Shanghai and Hefei, aiming to build an international R&D team. Founded in 1754, Columbia University is among the top universities in the world. 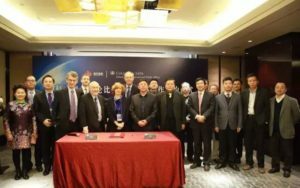 It has cultivated more than 100 Nobel laureates, and enjoys impressive accumulation of researches on engineering, applied sciences, clean energy technologies and industry policies.